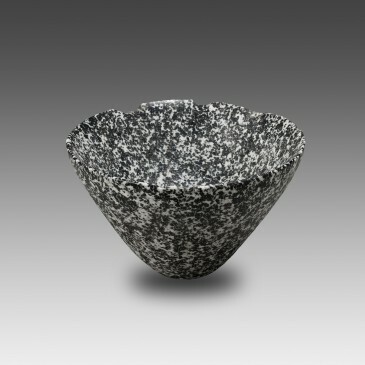 This vessel, whose shape is as simple as it is elegant, was carved from a beautiful block of granite with black and white mottling. Datation : 3rd millenium B.C. Category: Vessels. 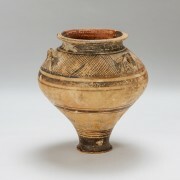 Tag: Conical Bowl. This vessel, whose shape is as simple as it is elegant, was carved from a beautiful block of granite with black and white mottling: this stone, which was largely used at the same time in Egypt for the manufacture of vessels or statues, is however rather rare in the Near Eastern world. 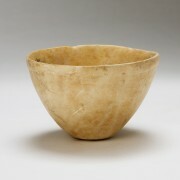 The very regular shape of the bowl indicates that it was carved and hollowed using a rotating technique, probably employing some sort of lathe. The circular base is narrow compared to the height, but nevertheless provides a good balance. The lip is slightly rounded. Stone was largely used in ancient times for the manufacture of containers of various shapes and sizes: stone vessels were considered luxury goods and were often found in the tombs of high-ranking individuals and in the treasures of sanctuaries. 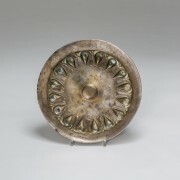 The shape of this bowl, perhaps inspired by Egyptian works, is attested by many different versions in Mesopotamia, both by stone examples and by terracotta or metal specimens. Excellent state of preservation, aside from large chips on the rim. Carved from a block of pink limestone, this large bowl with a rounded profile has a slightly asymmetrical shape and an irregular edge, nevertheless highlighted by a band with a thicker relief. Hammered from a single sheet of silver, this phiale is outstanding both for its quality and for its weight. All decorations were carried out in repoussé work.